A Ginger Mess: I'm Free!!!! 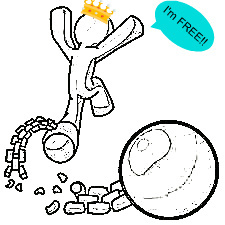 So for the next 60 days I am free! Free to be a mom. Free to be a wife. Free to be a friend. Free to finish my book Uncle Tom's Cabin and maybe even some others. Free to crochet blankets for certain people I love. Free to finish my pallet art that's been sitting on my back porch for the past 6 months. Free to cook dinner at night and Free to lay on my couch and be a bum and watch TV all night if I freakin want to!!!! Insert a very long sigh of relief here....aaaahhhhh....I just got of the phone with my finance and academic counselors who were none too happy to delete my upcoming schedule so I could take a much needed break to recoup and hope that my ulcer goes away so I can start back again in a couple months refreshed....unless I happen to come into a ton of money and Prince Charming and I can start our house flipping business we dream of doing....any takers?? No? Yes? Well, anyway...I'm free to blog to my little heart's content if I choose to. Just wanted to update y'all. Freedom. Love it! Happy Friday!!! Hi there. I found you over at Aloha Friday:) Yay to freedom! :) I'm about to lose mine in a few days. Oh my! good for you at least you are free for 60 days. I sometimes wish that I could regain my freedom even just for days. It would be a relief and rejuvenating. A time for yourself, isn't it great? :D just droppin by to say aloha. Aloha, Esther! Happy Friday! Thanks for stopping by :) and the follow! Welcome! It's My Sits Day!